Win tickets to the greatest classic racing festival on earth: the Silverstone Classic. 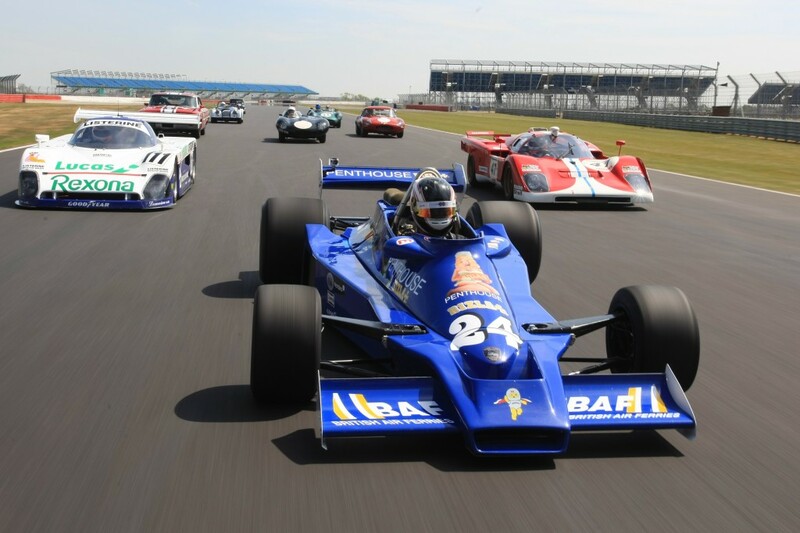 The Silverstone Classic (26-28 July 2013) is firmly established as the world’s biggest classic motor racing festival. The spectacular three-day event is staged at the famous Silverstone circuit in Northamptonshire, birthplace of the FIA Formula One World Championship and home of the 2013 Formula 1 British Grand Prix. The three-day festival features the very best of historic racing covering more than eight decades of motor sport as well as live music from classic rock bands and a wealth of family entertainment including free fun fair, retail outlets, a host of interactive activities and air displays, plus huge showcases of classic cars. This summer’s Silverstone Classic is all set to be another record breaker following confirmation of an action-packed programme of 24 races spanning eight decades of glorious motor sport history. The mouth-watering line-up for 2013’s extravaganza features all the hugely popular historic Formula One, sportscar, GT and touring car grids that produced such close racing last year… plus a further three grids to be announced in the coming weeks. You can win a pair of complimentary tickets here by simply letting us know your favourite Silverstone Classic or motor racing moment. As the home of the British Grand Prix and birthplace of the FIA Formula One World Championship, Silverstone is the perfect venue to celebrate the full spectrum of F1 history. And, with more than 100 of the most famous and iconic GP cars recreating many of the sport’s golden eras, there’s no better homage than the Silverstone Classic. The Historic Grand Prix Cars Association (HGPCA) will be out in force with packed grids for both spectacular pre-1961 and pre-1966 F1 cars that revisit five decades of technical rivalries from the Bugatti’s of the 1920s, through the Maserati’s and Ferrari’s of the 1950s to the dawn of the rear-engine epoch in the early 1960s when British-based constructors such as Brabham, Cooper and Lotus came to the fore. Grand Prix Masters puts the spotlight on the following generation of DFV-powered F1 cars, reliving a fantastic decade of GP racing from 1968 to 1978 as well as the rise of many of the British teams including Brabham, Lotus, McLaren, Tyrrell and Williams. Adding to the spectacle and rekindling many fond and magic memories, all these renowned racers compete in familiar period liveries. The comprehensive single-seater bill features two more exciting grids. Races for Historic Formula Junior and the combined F5000/F2 class were among last summer’s many highlights and both make welcome returns this July. All five of these open-wheeler categories are in race action twice at the Classic with a thrilling showdown each during both Saturday’s and Sunday’s busy schedules. Harking back to what many believe were the halcyon days of the world-famous Le Mans 24 Hours event, no fewer than five sportscar and GT grids are also on the unrivalled Silverstone Classic bill. The Royal Automobile Club Woodcote Trophy features post-war sports-racers up to the end of 1955, with victory last year going to the hard-charging Jaguar D-type of brothers John and Gary Pearson. The Stirling Moss Trophy stars slightly more modern pre-1961 sportscars with Lister Jaguars, Cooper Monacos and Maserati T61 Birdcages often to the fore while the World Sportscar Masters covers an equally exhilarating era from the mid-1960s up to 1974, boasting track idols such as the Porsche 917, Ferrari 512 and Lola T70. Moving the clock forward to the 1980s are the super-fast Group C prototypes that once again will race into dusk on Saturday evening. Last year’s entry featured legendary machinery from Jaguar, Mercedes, Peugeot and Porsche as well as a trio of Ferrari-engined Lancia LC2s. An even more alluring line-up is promised for 2013. Meanwhile Aston Martin will aim for a famous hat-trick of wins in the prestigious Royal Automobile Club Tourist Trophy for Historic Cars. Run for Pre-63 GT cars, victory in 2011 went to an Aston Martin DB4GT shared by racing legends Stuart Graham and Richard Attwood while last year’s encounter was won by Wolfgang Friedrichs and David Clark in the remarkable Aston Martin Project DP212. The Silverstone Classic also honours the very best of saloon car racing history with two stunning grids already confirmed. The first is for Under 2-Litre Touring Cars with a full 58-car field of battling Lotus Cortinas, BMW 1800 Tis, Alfa Romeo GTAs and Mini Coopers from the pre-1966 era. The second is another Silverstone Classic success story… Last year’s event staged a new tin-top showdown for Group A and Super Touring cars from the 1980s and 1990s. It was such an immediate hit with competitors and fans alike that the category not only returns 12 months on but also has spawned an exciting new series, to be run by the famed Historic Sports Car Club (HSCC). To house so much exotic and priceless motor sport history, the massive event will again fill both Silverstone’s National and new Wing pits and paddock complexes. The non-stop racing schedule, organised by the HSCC, is staged on the full Silverstone Grand Prix circuit with many races boasting fully subscribed 58-car grids. Adding to the Classic weekend’s enormous appeal, all tickets give free access to both racing paddocks as well as trackside grandstands and live music concerts on Friday and Saturday evenings. If you don’t win a pair of complimentary tickets through us, then tickets must be purchased in advance. Those booking before the end of March can take full advantage of special ‘Early Bird’ prices with adult tickets starting from just £30 (plus fees). Considerable savings are on offer for festival goers spending the full weekend at Silverstone and special packages for car clubs and their members are also available. Full details can be found on the official website. 9 comments on "Win tickets to the greatest classic racing festival on earth: the Silverstone Classic." My favourite motoring event would have to be the Lotus Festival 2012 when my b/f and I were asked by a man who got out of the car and taken his helmet off to push his Lotus T79 up the Paddock and parked at the top of the hill (my b/f suddenly coming over all funny and ‘young’). It was hot and sweaty but we agreed!! He then got out of the car and me and my b/f shook his hand. As he left I asked my b/f who it was and he said, “That was Clive Chapman, Colin Chapman’s son!! !” No wonder he’d gone all gooey!! One of the best days of our lives. The Silverstone Classic is an event i’ve never had the opportunity to visit as yet even though i have been to Silverstone for many other events. My favourite Motor-Racing experience would have been back in 1994 at Donington Park where i watched my 1st BTCC Race with my Dad! This was back in the days of Super 2000 cars! I fell in love with the series straight away and have been spectating ever since. One of the best moments in Motorsport for me.The Brazilian Grand Prix 2008. Massa needed the win & Hamilton took Glock on the last corner of the last lap putting him 5th to be f1 Champion.One of the best races ever. Haven’t been to the Silverstone Classic but went to Donnington last year and had an awesome time. Having full access to the pits and garages was the highlight for me, and being able to get close up to some of the most spectacular classic cars in the world!! Looking forward to Silverstone 2013!! Love love love the Silverstone Classic, my fave event of the year bar none. Don’t know of another race meet that gives spectators such incredible access. Absolutely loved watching entire 70s F1 field starting up in the paddock and seeing driver changes in the old pit lane, you cannot get closer to the action unless you’re dressed in Nomex. The amazing sight and sound of pre-war cars streaming through Vale, their drivers sawing at the wheel and leaning out of the cockpit as they coax their steeds into Club…. I think in 2012 when an astonishing grid of more than 40 touring cars spanning from the Seventies through to the hallowed ‘super touring’ era of the Nineties, which included a selection of iconic Ford Sierra RS500s! Or the magnificent Group C cars running into the evening dusk. With headlights ablaze and brake discs glowing, the cars make a magical sight as the sun set over the Silverstone Grand Prix circuit. My favourite motorsport moment was seeing Gilles Villeneuve driving on 3 wheels at Zandvoort in 1979, when one of his tyres burst. I loved his determination and the fact that Ferrari made their own car in its entirety, including the engine and gearbox. Nigel Mansell winning the F1 drivers title, because I’d waited too many years for British success since becoming an F1 fan as a kid at the turn of the 80s. All those BBC2 late night half hours.